THE ODES AND CARMEN SAECULARE OF HORACE : AELI VETUSTO. This site is dedicated to bringing you information about the wonder that was the Roman Empire and how its legacy still shapes our history, our language, and the foundations of our society and its institutions. The Roman Empire endures! The City of Rome was traditionally founded in 753 B.C. by our calendar. 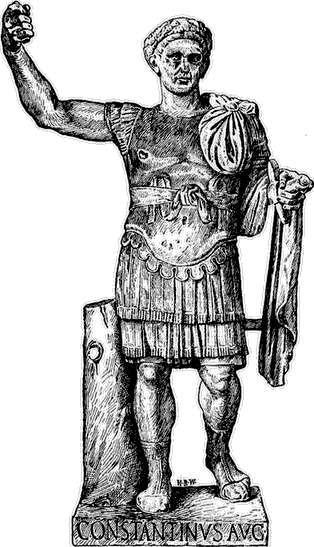 The Romans measured their calendar from the foundation of the City, or "Anno urbis conditae". By their calendar, today is Anno Urbis ("The Year of the City") 2768. 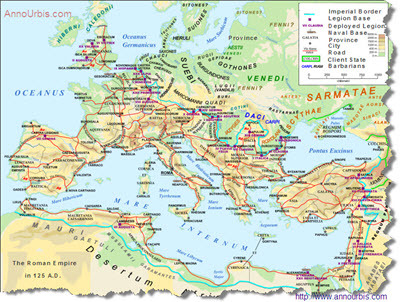 The Roman Empire at its greatest extent comprised most of western Europe, the Middle East, and North Africa. Larger than even most modern nations, the empire was held together by a network of roads, a common language, and most of all a culture which still today exerts a powerful influence on our society and institutions, over 1600 years after the fall of Rome. No other empire or civilization has had such a lasting and significant impact on the modern world. Bulfinch's Age of Fable - an important reference work giving descriptions of Roman and Greek myths and their gods. Ancient Rome - The Story of Rome's Foundation and early history, until the end of the Monarchy and establishment of the Republic. The Decline and Fall of the Roman Empire - The Classic 6 Volume Work by Gibbon is presented in full online. The Old Roman World: The Failure and Grandeur of Its Civilization - Beneath the pomp and pageantry, marble buildings and glory of empire, Rome was rotten to the core. The Last of the Tribunes - A work of fiction by the author who gave us "it was a dark and stormy night ..."
A History of Rome During the later Republic and Early Principate - the title says it all. Latin Authors - A small but growing collection of Roman authors such as Caesar, Horace and Cicero. A Latin Reader - This introductory latin text introduces easy Latin phrases and passages from classical authors so you can practice your translation skills. Social Life at Rome at the Time of Cicero - A candid account of what it was like to live in Rome at its height. A treasure trove of information. Roman History By Titus Livius - A classic history of Rome by one of its greatest authors. This is how the Romans saw themselves. Ruins, or Meditations on the Revolutions of Empire - Not strictly just about Rome, but it has a lot to say about the fall of civilizations. Roman Religion - A history of the development of Roman Religion from the earliest days Rome until the coming of Christianity. The Story of Rome From the Earliest Times to the End of the Republic - How did Rome come to dominate the Italian peninsula. Suetonius's Lives of the Twelve Caesars - A candid biography of the twelve Caesars who shaped the fate of the Empire and the Western world we know today. Written by a contemporary. Plutarch's Lives - The classic work by Plutarch, comparing the lives and characters of prominent Romans to Greek counterparts. And lord and slave keep holyday.